Lost and Lovin' It, the new full length from Kepi Ghoulie draws influence from the entire spectrum of his long career - from upbeat pop punk ragers to mellow introspection of catchy folk/americana. GORGEOUS PACKING! Beautiful Vinyl! Comes with a treasure Map designed by Tom Neely. 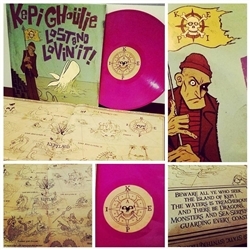 PETS - Get Turned On cd Kepi Ghoulie- I Bleed Rock N Roll Red Vinyl LP Kepi Ghoulie Electric European Tour 2009 Poster Kepi Ghoulie Valentine 2015 Blue Vinyl 7"